The Session is a monthly project where a bunch of beer bloggers all blog about the same topic. You can read more about the project here. This is PintLog's first time contributing to the project. This month's host is John Duffy (A.K.A. The Beer Nut), and the topic he has chosen is Love Lager, a meditation on the style that most people associate with the word beer. When thinking about the typical American Lager, three brands immediately spring to mind: Budweiser, Miller, and Coors (collectively known in some beer circles as BMC). These brands account for the majority of American beer produced each year. Differentiated more by marketing than any tangible product attributes, each brews their own version of the American Adjunct Lager. As if the typical American Adjunct Lager wasn't bland enough already, most Americans actually prefer to buy the "light" version of the style. Made popular by Miller in the 70s with Miller Lite, the Light American Adjunct Light Lager is lower in calories, carbohydrates, and (typically) alcohol content. Unfortunately, they're also lighter in flavor. So the question to be asked is do these beers offer anything but a cheap and quick way to get drunk? 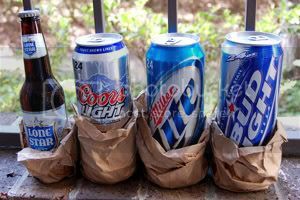 To help answer that question, I decided to do my best to objectively review the three best selling American Adjunct Light Lagers: Bud Light, Miller Lite, and Coors Light (they're also three of the four best selling beers in America regardless of style). And just to keep things interesting, I also reviewed the light version of a local favorite: Lone Star, known as the "National Beer of Texas." We Texans are a funny bunch. I decided to do this the right way, so I headed across the street to the gas station to pick up my review material. Lone Star Light was only available in six-packs, and ran me around $3.50. That's quite possibly the cheapest six-pack I've ever bought. All three nationwide beers were available in handy 24 ounce tall boy cans, for around two dollars. As a bonus, all three were wrapped by the cashier in individual brown paper bags. Let's unwrap these bad boys and dig in. 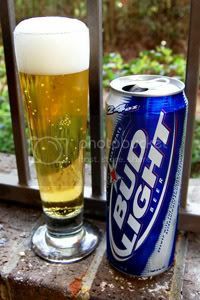 First up, Bud Light, the big boy on the block and the best selling beer in the world (according to Anheuser-Busch). "Drinkability" is the latest Bud Light campaign, and seems to be based on the idea that you don't want pesky things like flavor to get in the way of your drinking. With a fuller mouthfeel than usual for this style and a relatively pronounced (if still grainy) body, Bud Light is not the "most drinkable" here. Which is certainly not a bad thing. You can read my full Bud Light review here. Next, the beer that started it all, Miller Lite. 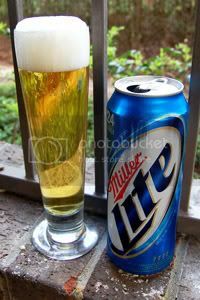 Now the third best selling beer in America (behind Bud Light and Budweiser), Miller Lite positions itself as the light beer that's just too light for a "GH" in the name. Seriously. A new, unintentionally hilarious, campaign touts the beer as a great way to "Get Hip to the Hops." The beer itself is the same fizzy, yellow stuff as the others, but plagued with a nasty chemical taste. You can read my full Miller Lite review here. 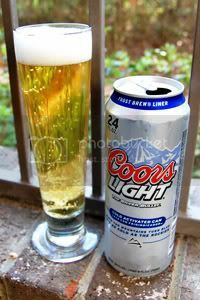 Number four on the American sales charts is Coors Light, the "Silver Bullet." Coors markets the beer almost exclusively around the concept of coldness, which I suppose is rather telling. Without a doubt the most gimmicky delivery device here, its can has a vented mouth, a "Frost Brew Liner," and a "Cold Activated" mountain scene on the side. The beer itself has a better flavor profile than most beers in this style, but almost no nose whatsoever. You can read my full Coors Light review here. In order to keep things a bit interesting, I felt compelled to add a local favorite. Here in Texas, Lone Star is the local Lager for most people. Because it wouldn't be fair to compare three light Lagers to a regular Lager, I've opted for Lone Star Light, a beer that I'd never actually tried before now. Unfortunately, it's just as bland and soulless as the national fare. On the plus side, it does have some awesome pictogram puzzles under the bottlecap. You can read my full Lone Star Light review here. So, after tasting them all, how do they rank? In fourth place, Miller Lite - the chemical taste just killed it. 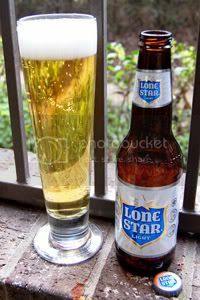 In third place, Lone Star Light - much blander than the "National Beer of Texas" should be. In second place, Bud Light - a fuller body than the previous two beers, but just too grainy to win. And our winner today, a total surprise to me, is Coors Light - hardly a full-flavored beer, but the best taste profile of the group. So, after my best attempt at objectively reviewing the three big American Adjunct Light Lagers and a local wildcard, has my low opinion changed? Not at all. Viewed alone in a vacuum these beers are not necessarily bad (aside from an occasional chemical taste); but when compared to the rest of the beer world, they're just not good. They don't taste like horse piss or even cat piss. If I'm offered one of these beers at a party, am I going turn up my nose and refuse, citing the superiority of craft-brewed beer? Of course not. Remember, just because someone likes these beers, that doesn't make them some sort uncultured philistine. Think how much money they're saving over saps like me! Adjuncts used in adjunct lager brewing are not significantly cheaper than barley malt. They were historically used to lower the protein content and astringency of North American 6 row barley prior to the successful Canadian 2 row barley breeding programs of the 70's and 80's for growing dry land barley. Low cost factored into their use more in the past more than today, but an all malt beer before the successful breeding of North American 2 row malt was astringent and tended to be hazy at low serving temperatures. Their use now is about light flavour. Brewing with corn and rice increases energy use and brewhouse cycle times. In the case of high maltose corn syrup cycle times reduce and plant efficiency goes up. This comes at a cost. Corn syrup is generally more expensive than malt lately. All malt is used in craft circles because it is actually cheaper and markets better due to the difference. The plant required for using adjuncts is usually prohibitive and is more complicated to use. Many thanks to Mike for the info.